Belina's Adventures: Mexico City..... The City of Palaces...! Mexico City..... The City of Palaces...! Cortés first saw Tenochtitlán on 8 November 1519. Upon viewing it for the first time, Cortés and his men were stunned by its beauty and size, while the Aztecs were repulsed by these fetid smelling animals who did not bathe and were full of pustules and sickness. The Spaniards found there was indoor plumbing, bidets, asophisticated cuisine and a fully formed society long established and working with efficiency and safety. The Spaniards marched along the causeway leading into the city from Iztapalapa. Although Montezuma came out from the center of Tenochtitlán to greet them and exchange gifts, the camaraderie did not last long, Cortés put Montezuma under house arrest, hoping to rule through him. Tensions increased until, on the night of June 30, 1520 - during a struggle commonly known as "La Noche Triste" - the Aztec revolted against the Spanish intrusion and managed to capture or drive out the Europeans and their Tlaxcalan allies. (To this day the people of Tlaxcala are reminded of their shame) Cortés regrouped at Tlaxcala. The Aztecs thought the Spaniards were permanently gone. They elected a new king, Cuauhtémoc. Cortés decided to lay siege to Tenochtitlán in May of 1521. For three months, the city suffered from the lack of food and water as well as the spread of smallpox brought by the Europeans, along with the introduction of veneral diseases which until that point where unheard of here. Cortés and his allies landed their forces in the south of the island and fought their way through the city, street by street, and house by house. Finally, Cuauhtémoc had to surrender in August of 1521. Plus, the Aztec seers had predicted the invasion and so went along with the "fate" deigned by the gods. The Spaniards practically razed Tenochtitlán. Cortés first settled in Coyoacan, (right, Coyoacan today, a lovely spot to people watch, sit or jog) but decided to rebuild the Aztec site in order to erase all traces of the old order. Cortés did not establish an independent, conquered territory under his own personal rule, but remained loyal to the Spanish crown. The first viceroy of the new domain arrived in Mexico City fourteen years later. By that time, the city had again become a city-state, having power that extended far beyond the city’s established borders. Although the Spanish preserved Tenochtitlán's basic layout, they built Catholic churches over the old Aztec temples and claimed the imperial palaces for themselves. The old religions were still practiced but was kept underground. Tenochtitlán was renamed “Mixico,” its alternative form name, as the Spanish found this easier to say. Mexico has had many changes since then, the Spanish had a large influence and many of our descendants are from Spain; the French also left us many influences (food too!) and they can be seen in the organization of Mexico City's streets and construction. There is a heavy French influence in the classic buildings found in the area, and elsewhere, the wide avenues reminiscent of those in Paris, we even have our very own Champs Elysees in the Paseo de la Reforma running across the city. Eiffel's buildings can be seen in and around town as well. (left, the statue in front the Palace of Bellas Artes, an incredible building), which along with the Colonial architecture majestically represented, make for quite a wonderful mix. Thinking about food bring us to remember statements made by Bernal Diaz de Castillo, in his chronicles of the Mexican conquest and his arrival to this area. 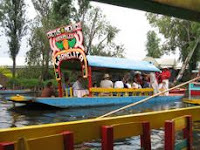 When he first saw Tenochtitlan he was so impressed by the size, scope and variety by everything he was witnessing, he said this marketplace was comparable to those in Venice and even in Europe and he had never seen anything to compare! The Central de Abastos markets (which provides foodstuffs for restaurants and everyone else) are so large, there are separate markets (each 5-6 stories high) for fruits and ve getables, fish, etc, and items are brought in from all over Mexico daily, you can find it all here. I love going to La Viga, Mercado Jamaica or San Juan Market or any of the others.... on the top floors you have all the eating places where you can eat for a reasonable amount. If you're game, it's worth the adventure. For the longest time you would hear how unsafe Mexico City was, how you'd take your life in your hands if you ventured anywhere and kidnapping was a sure bet; I don't know about anyone else, but not only have the stats on crime improved greatly, but in the multiple times we've retuned to the city, and we go all over, we've never had a problem. You need common sense, just like anywhere else in the world and there ar e some areas you don't go, like Tepito for one. You don't wear showy jewelry, carry expensive cameras, flash cash and you don't dress to impress. I always take approved taxis from a restaurant or hotel or if we're feeling particularly adventursome, we hire a car for the day (cost is comparable to taking taxis, but you need to supply lunch for the chauffeur, check with the concierge) which makes it so easy to come and go since you have a car waiting and no parking problems, plus if you're not intimately familiar with the city, you have a local who knows the good places to go, the hotel recommends him and you don't have to worry. You don't have to miss a thing and squeeze the most from your time here. Don't worry if your budget doesn't include 5 Star locations, sure, if you can afford it there are the most wonderful top of the line destinations here of course, but you can also have a wonderful time on a limited budget. From hotels for the entire family (the 4 of us have stayed in great 4 star hotel for about $500 pesos a night), and you can find a hotel to fit your budget easily, from cheap hostels for $11 US per person all the way to the most luxurious acccomodations you can think of, B&B's or whatever you prefer. Also, take into consideration that not all hotels are advertised on the internet, there are plenty of nice hotels you'd need to go in person to obtain a room. Don't worry about having to go to expensive restaurants in order to have a good meal either, there are family run restaurants called "comidas economicas" i n which you can have a complete meal (soup, entree, sides, drink and dessert) for under $40 pesos! Street food in Mexico City (like fast food elsewhere) is very economical, you can have a large torta (torta de milanesa which is breaded steak) for $25 pesos, tacos for $6-8 pesos each, a soda for $6-8, a fruit plate for $35 pesos or even churros on the street for $10. Of course you'll find the US chains here all over, from McD's, to Starbucks, Chili's, TGIFriday's, KFC, etc. in case you're not the adventuresome type and that also includes US hotel chains like Best Western, Holiday Inn, Marriott, Sheraton, Four Seasons and more. I hope you will consider a visit to Mexico City so you too can discover how great this city can be and how many opportunities it offers for everyone to learn, discover and share the most surprising things you never thought you'd find in Mexico. We love it! 'M an architect and a part time blogger,this is just wonderful. Thanks for this good post. Architecture is my passion.